Paradox in the Kitchen: To Cook or Not to Cook? America’s consumers value home cooking, yet they are also dedicated restaurant diners who love going out to eat even more than cooking at home. If home cooking ain’t what it used to be, then what is the reality of cooking today? Cooking has taken a lot of heat lately (pun sort of intended). There has been widespread reporting of its demise as America’s consumers are increasingly opting to eat out rather than stay in and cook at home. Our Transformation of the American Meal 2017 report finds that long-term shifts in broader cultural values and notions of a healthy diet have undermined “traditional” ways of eating while changes related to work, gender and parenting have reshaped how households approach food and eating when time and energy are scarce but food is abundant. The consequence: a deprioritization of the mealtime ritual and of cooking in general. But don’t write off cooking just yet. Many consumers still see cooking both as a valuable skill and as something they generally enjoy — no matter how much they might be spending at restaurants. Most consumers still believe in and aspire to an ideal — a healthy meal, made from scratch, enjoyed with others — that stands in contrast to the reality of most of the meals. The reality is that today, few individuals do scratch cooking on a regular basis. Many consumers bemoan their overstretched schedules and/or underdeveloped cooking skills, thus cooking responsibilities are regularly outsourced to food manufacturers, restaurants and other food purveyors. Americans value home cooking, and few admit to having little interest in cooking. Our Transformation of the American Meal 2017 report finds that 61 percent of consumers say they “love to cook at home,” compared to only 14 percent who “have no interest in learning to cook.” Many consumers assert to be knowledgeable cooks (45 percent), and yet most cook simple meals (69 percent) and rely on shortcuts and meal helpers (39 percent). At the same time, Americans are dedicated restaurant diners who love going out to eat (71 percent) even more than cooking at home. This paradox reflects the fact that culturally, American consumers still tend to agree that the best meal — the healthiest, tastiest and most emotionally and physically satisfying — is a freshly cooked homemade meal. But what constitutes a homemade, cooked-from-“scratch” meal? 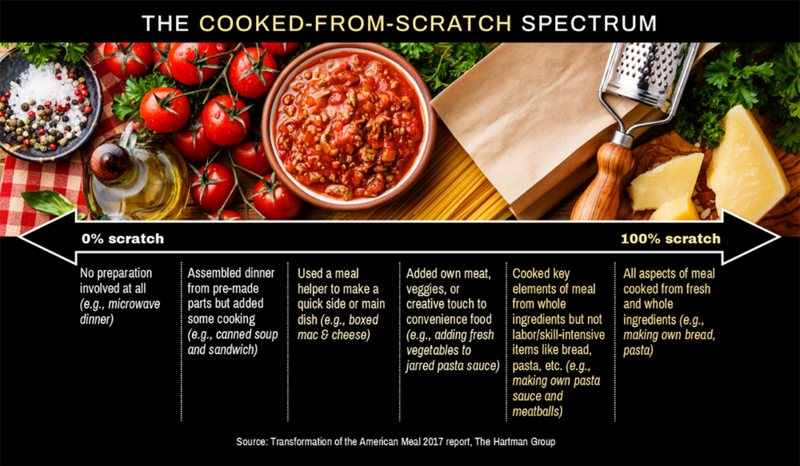 Transformation of the American Meal 2017 finds about 7 in 10 consumers (69 percent) “eat meals cooked at home from scratch” multiple times a week, but as the following chart depicts, scratch cooking can have a wide variety of meanings. Most consumers rely on a variety of shortcuts and meal components to pull off meals cooked at home. Even dedicated scratch cooks use shortcuts, but a cook’s commitment to scratch cooking often defines what shortcuts they will use. One’s commitment to scratch cooking tends to reflect one’s broader approach to food, eating and cooking. Scratch cooks prioritize social meals with freshly cooked, high-quality food. 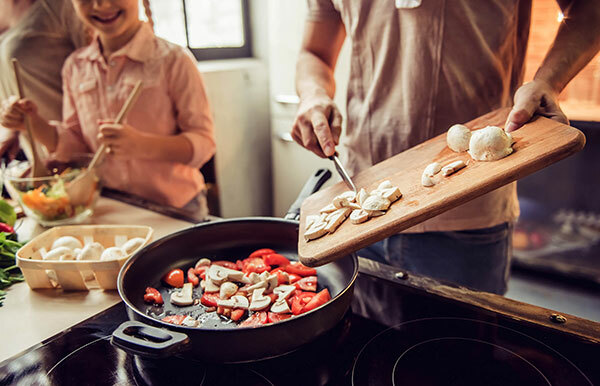 Planning is never perfect, and shortcuts often double as backup plans, no matter how dedicated one is to a freshly cooked meal. When it comes to shortcuts, younger consumers and those with kids are generally more likely to use a greater variety of meal components more often. These groups overlap considerably, but their reasons for using components can differ. Parents are often dealing with more complicated household schedules, picky eaters and the need to simply get dinner on the table. Younger consumers without kids may have limited skills, making shortcuts more appealing. 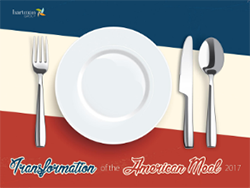 Transformation of the American Meal 2017 is a comprehensive examination of the factors shaping the American meal today and provides implications for stakeholders in the food, beverage, food retail, restaurant, and food service industries. The report explores how traditional notions of the mealtime and meals have evolved — and what remains the same.